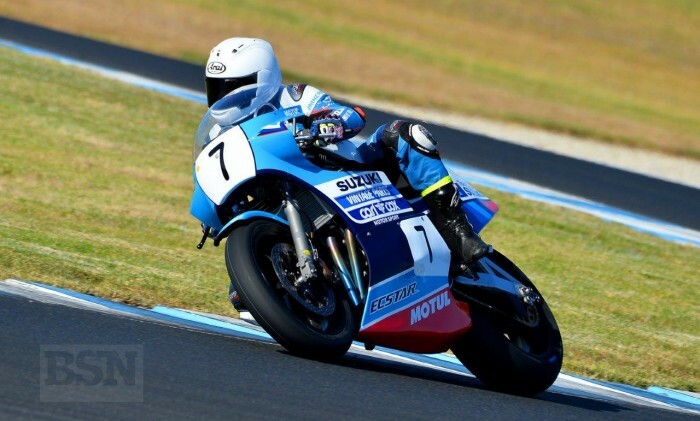 A tenth in race one and a eighth in race two has seen Britain’s John Reynolds more than happy with his day’s work the International Phillip Island Classic. Reynolds, who posted his fastest lap of the day in race two with a 1’39.883 has been riding his Carl Cox Motorsport/Team Classic Suzuki XR69 all weekend and not really done too much to it. “I just need to learn the circuit. This circuit is such a hard track to get right as it’s so fast. It’s really important to hit every single apex, as it as at every other circuit, but this one more so than any other,” Reynolds told bikesportnews.com. Seeing as Reynolds’ stable-mate is running the same bike as him, Reynolds was told what he had done, which pretty much transformed the bike. Reynolds described his XR69 as a beautiful motorcycle to ride and he’s loving every minute of it. At the conclusion of the first day of racing, Reynolds finds himself sitting in sixth place in the individuals honours with 64-points on the board, just two points shy off from the former triple Australian Superbike Champion, Shawn Giles. It’s fair to say that Reynolds was not even expecting to be running that far up the pointy end in terms of the point’s standings. “I’m a 55 year old bloke who is riding a motorbike and having a good time while doing it. I must admit, you know that feeling of euphoria you get when you finish a race, well I haven’t had that since I retired. I actually had it this afternoon. I really, really enjoyed it. I’m riding the bike hard and I know I am and the bike is working,” beamed Reynolds. In fact, after a total of twelve laps raced today, Reynolds has the ‘feeling’ of being a racer again. “I have the bug for it. I might start looking for a BSB ride this year,” joked Reynolds. Now that Reynolds has two races under his belt, he knows what to expect, can he possibly starting thinking of maybe finishing fifth overall, even fourth overall come Sunday afternoon? Reynolds openly admits that he doesn’t really know. The problem is that he has qualified poorly – thirteenth place on the grid which puts him on the fifth row of the grid. A rider in front of Reynolds is a bit of a slow starter, which is not helping his cause for the run into Doohan Corner. “I have to think about that one. Its either I reposition myself so I can go around him or just get the shoulders and elbows out and barge through. All II don’t want to do is to get into a mess. I’ll get through turn one and then dig it from there. We’ll see what happens,” finished Reynolds.